Welcome to Happy Trails Kennels, the home of four-time Iditarod Champion Martin Buser and family. We welcome guests from all over the world to visit us, our training facility, kennel, to meet the athletes and of course the stars of Happy Trails, the dogs. Happy Trails Kennel was established in 1982 with the express purpose to raise and train happy, fast long distance sled dogs to race and win the Iditarod. The kennel began with the cross of an Yukon River village dog named Petuk and a German Short-Haired Pointer named Faulk. In the beginning years, Martin began to believe that the sprint dogs raised and raced by prominent sprint mushers Gareth Wright and George Attla could be trained for long distance. Martin and sprint musher, Jim Welch, who also lived in the Eagle River area at the time, became friends. Martin handled for Jim as he raced in several Sprint Races. Jim and Martin developed a symbiotic relationship based on great dogs. Jim had limited time, he worked full time, and space, his kennel was in a local neighborhood, and Martin had winters open and much more acerage so they began doing litter splits. Jim had meticulously studied pedigrees of Gareth Wright and George Attla race dogs and was a genius when it came to breeding dogs. He had dogs from both kennels. Martin ended up raising and training puppies and at a previously agreed upon age, Jim and Martin would train the dogs together. Jim wanted dogs with top speed. Martin was looking for athletic well built fast dogs but didn't really need the absolute fastest. The friendship and relative success of the kennels grew. Jim was diagnosed with MS which prematurely ended his dog racing career. Martin had, in the mean time, acquired genes of some of the most athletic fastest dogs in Alaska. They were termed hounds due to a relatively shorter hair, sloping back and sharply angulated front shoulders. Many well established Iditarod mushers laughed at Martin's experiment, said the dogs would never survive the rigors of the Norton Sound coastal winds, would lose their appetite and would have to be babied all the way to Nome. Indeed, they did require some babying and still do today but they fought through one of the Iditarod's most dangerous storms in 1991 to arrive second in Nome. That race was pivotal in the history of Happy Trails Kennel. Martin knew his dogs could prevail and he was right to believe that speed and athleticism was a winning combination. 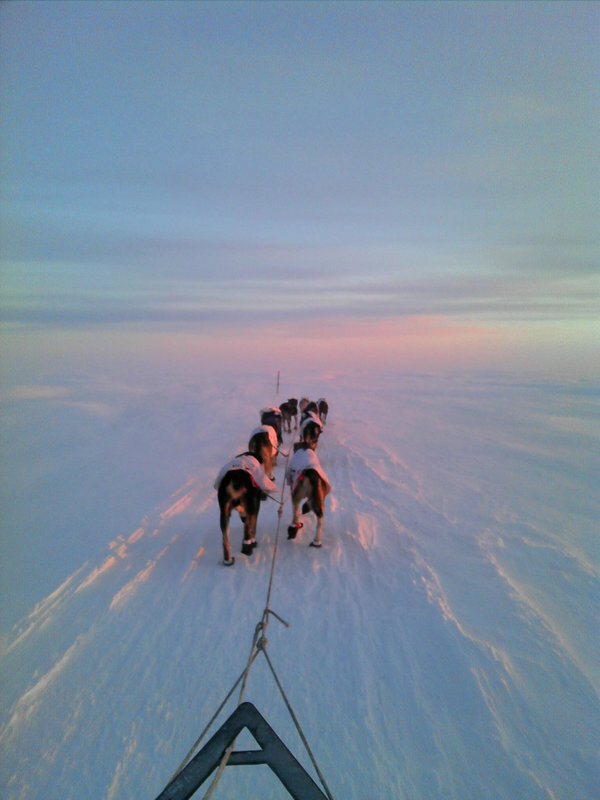 Martin's faith in his hounds was further consolidated by his Iditarod win the very next year. And indeed his breed held for nine years the record for the Fastest Iditarod Race Ever. We offer a variety of fun merchandise to help you remember your visit or share the experience with friends who love dogs. We welcome visitors and are open to the public seasonally every hear. We'd love to see you! Plan your visit here. You can book a tour here on our website through our online booking service. Be sure to read our blog and follow Martin Buser on Facebook. What are the dogs' names? How do dogs and people survive subzero temperatures? What is the special bond between musher and dogs? Read on for Martin Buser's answers to these and other popular questions.